A tanker truck of gasoline crashed into a line of public buses in southeast Iran, exploding into a fireball that killed some 70 people, a provincial governor told state television Friday. Hossein Amini, governor general of Sistan-Baluchistan province, said the accident killed 71 people and injured another 108. 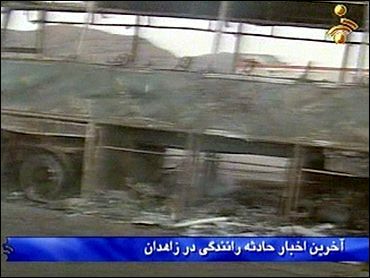 The governor of Zahedan city, Heidar Ali Nouraei, said many of the bus passengers burned to death because of a lack of firefighting equipment at the scene, a police station on the highway between Bam and Zahedan, about 690 miles southeast of the capital Tehran. "It took time before firefighters arrived at the scene from Zahedan, 69 miles to the east," Nouraei told state television. The accident happened at 10:30 p.m. on Thursday when the tanker apparently ran out of control and collided with buses full of passengers that had stopped at the police station. Trucks and buses often wait outside police stations on highways in southeastern Iran to be inspected for drugs and other contraband. Sistan-Baluchistan lies astride a major route for smuggling drugs from Afghanistan and Pakistan to the West. The television broadcast pictures of the survivors crying and slapping themselves in the face as a ritual of mourning. The television showed buses gutted by fire and at least one long vehicle turned on its side. Smoke was rising from part of the crash scene after dawn on Friday. The official Islamic Republic News Agency said a truck containing tar was one of those hit by the tanker. The tanker was carrying 4,680 gallons of gasoline, the television reported. The cause of the crash was not clear, but the news agency said the tanker seemed to have suffered a failure in its steering mechanism. Iran has one of the world's worst rates for road accidents. There were more than 400,000 crashes and 21,000 deaths on its roads in 2002. The high tolls are blamed on unsafe vehicles, disregard of traffic laws and inadequate emergency services.